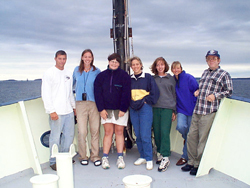 SMS graduate students at sea. The School of Marine Sciences offers M.S. and Ph.D. programs in Oceanography and Marine Biology, and an M.S. program in Marine Policy, a Professional Science Master (PSM) in Marine Sciences, and a dual (M.S.) degree that comprises one degree in Policy and one in Aquaculture, Marine Biology, or Oceanography. We pride ourselves in providing truly interdisciplinary experiences by tailoring coherent knowledge, skills and abilities training to individual student needs around a solid package of fundamentals. 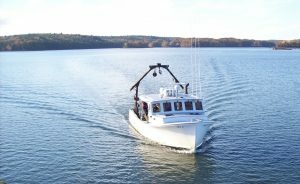 We have ready access to the diverse and unique marine habitats of the Gulf of Maine, including offshore basins, banks and ledges, estuarine and coastal waters, tidal marshes, sandy beaches, mudflats, and the most extensive stretches of rocky shore on the Eastern seaboard. In addition to these local research opportunities, the world-wide research activities of the program faculty provide extensive possibilities throughout the global ocean. With roughly 30 faculty, the SMS offers graduate students a wide variety of courses and extensive research opportunities. Graduate students can easily find a research cluster to match their interests, or develop a new one by drawing together the talents of our own and allied faculty from other units at UMaine. To learn more about the current research projects of SMS faculty and graduate students, visit our research clusters and individual faculty web pages. Prospective students are strongly encouraged to contact faculty and graduate students directly to discuss common research interests. “Cold calls” are more than welcome. The graduate experience is a partnership and apprenticeship that begins even before the formal paperwork. Nearly all graduate students and faculty participate in this highly anticipated annual event at the Darling Marine Center. If you are interested in applying to one of our programs below, you should be aware that the SMS application process has two essential steps. The first is an application to UMaine’s Graduate School. This step allows the SMS Graduate Admissions Committee to evaluate whether your background meets our academic requirements. This step is necessary but not sufficient for admission. A second essential step is to identify an advisor and a source of financial support for your graduate work. We recommend that you take an active part in this step by identifying your research interests in your written application as specifically as you can and by contacting the two to four potential advisors whose interests most closely match them. If you are ready to apply, you can connect directly with the Graduate School’s Application Page. If you would like some advice on how to complete a compelling application, you may read on. Now that you have decided to apply to the School of Marine Sciences, how can you maximize your chances of acceptance? One of the best ways to gain entry to graduate programs is to compete successfully for national fellowships and scholarships. Beware that many of these competitions have deadlines well in advance of the applications deadlines for the graduate programs themselves. Ideally, you will already have made contact with a prospective advisor and will be getting advice about how to improve your application prospects for these enabling awards. 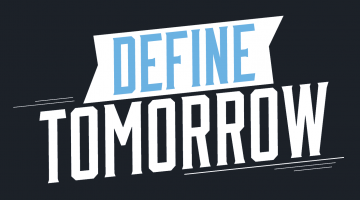 First, there are four sets of materials common to most graduate applications: grades, test scores, recommendation letters and a personal essay on why you want to come here and what you might want to do. Try to look at each from the perspective of a graduate admissions committee with a large stack of applications from highly qualified applicants for a small number of openings, and be honest with yourself about your prospects. If you know that you fare poorly on one criterion, make sure that you excel on others. On a 4.0 scale, grades below 3.0 are cause for concern. What you took (how challenging) is also important, as is whether your grades showed an upward or downward trend through your undergraduate career. Good grades in mathematics and physics are clear assets. If it didn’t happen during your undergraduate career, consider taking a summer or evening course on a tough subject to add to your portfolio. Many applicants profess to do poorly on standardized tests under high pressure. What should the committee do, however, when some applicants have high scores and some have low? Consider retaking the GRE if you fared poorly, and pay close attention to the grading procedures. Members of the admissions committee share your distaste for working on a show of skills versus the skills themselves, but these standardized test scores are one way to level the playing field among applicants from schools that committee members may know poorly or not at all. And if you truly master the skills, you need pay less attention to the grading rules. What constitutes a good recommendation letter? A letter that will be an asset shows through providing specifics of your interactions and performance that the writer knows you very well. A strong letter can counterbalance weakness elsewhere, especially if the writer knows you in a research setting (e.g., during an internship or work-study opportunity) or rigorous classroom laboratory setting. Things we look for include evidence of a strong work ethic, initiative and creativity. What should you put in your essay? Again try to consider the perspective of the admissions committee. They are trying to use this letter to decipher whether you have realistic expectations of graduate school and know why you are choosing to apply here. Educate yourself on the institution at least through its web pages and by reading a few publications of its faculty. Don’t focus on a specialty for which the program has no potential advisor. Dramatic writing has its place, but not in your essay. Saving the oceans and feeding the world from the oceans are not realistic graduate goals. Aiming at pieces of those issues (e.g., a particular fate or effect of a pollutant, a particular management strategy or a particular food-web pathway or fishery) in the limited duration of a graduate program is far more realistic. Naming faculty members whose work particularly interests you is a good idea. Explaining why is an even better idea. Choosing and naming only a single advisor as a target has obvious risks that should be reduced by prior communication with that person (e.g., by e-mail) to confirm that the person might be interested in advising you. One way to compose an effective essay is to choose two to four people in the unit or program to which you are applying as an imaginary audience and explain why you want to work with them. Go ahead and list them afterward as (non-exclusive) examples of people with whom you might work. There is no more important decision that you will make in applying to and entering graduate school than choosing your advisor. Indeed that choice should be a primary reason for applying to a particular school. If you have no idea who your advisor might be, you have not done enough research into graduate schools and you likely are wasting the money you put into the application. The above recommendations are pretty generic for marine sciences graduate schools and graduate schools in general. What should you know about UMaine’s School of Marine Sciences graduate admissions criteria and procedures? On a 4-point scale, we expect most successful applicants to carry a GPA above 3.0. GRE scores much below 70th percentile generally require some counterbalancing evidence of skills or abilities. We will not admit students without an identified advisor, and your conversations with that advisor should give both or you a clear idea of where your support is coming from. Sometimes it is unclear whether to apply for a Masters or PhD degree, especially if you are interested in proceeding through a PhD program. For many students, an M.S. is their intended terminal degree, and we encourage such students to apply to Maine. For students intending to get a Ph.D., it is sometimes a good idea to get a Masters first, and even to get a Masters at a different institution than the Ph.D.. Sometimes students start in one degree and shift to the other during their program, and these shifts go in both directions. Do not be shy about exploring these intentions and options in your application letter and communications with potential advisors. You may even apply for both. As an institution, we have no bias against M.S. applications or degrees. To help applicants better understand what they can expect and what is expected of them, we provide an approximate schedule that we recommend they follow and explain what happens during the application cycle. The most frequent source of poor communication for us is a missing piece in the application (e.g., a letter of recommendation or a GRE score). We do not get your application from the UMaine Graduate School until it is complete. For that reason we strongly recommend that you contact the Graduate School for confirmation as soon as you believe that all your materials have arrived. First obtain confirmation from your references that your letters have been sent. It is very sad when a highly qualified candidate misses deadlines for institutional (UMaine) fellowships because a piece of the application is missing.